Anxiety in children can quite easily go unnoticed, with well-meaning parents often dismissing anxious symptoms as a ‘stage’. Childhood is often viewed by the general population as an incredibly happy time in one’s life, irreplaceable and generally, stress-free, especially in comparison to the daily stress of adult life! However, this is not the case for every child. So how do you spot anxiety in children? First of all, 7% of children experience intense anxiety during the course of childhood. So if you believe your child is suffering from anxiety, one of the most fundamental things to do is talk with them and let them know that they are not alone. If your child is unable to perform tasks you know they can or should be able to, or are lacking in areas in comparison to other children, then perhaps it is time to seek help. A child with anxiety will usually have a heightened sense of perceived fear and cannot be easily distracted from this stressor, causing ‘over-reactions’. Perfectionism may be a dominant trait and the child may often ask for help with activities that they are capable of doing themselves. This is an avoidance method as it eliminates the potential for performing the activity ‘wrong’. Unfortunately this means the child may miss out on vital learning, which in turn depreciates confidence when the child compares his abilities to others. The child may seek reassurance regularly and be extremely attached to a person or object, such as a toy or blanket, and cries over small things. If you notice your child is suffering or regularly complaining of headaches, tummy aches, and diarrhoea for example, may be another indicator that they are suffering from anxiety. Ongoing stress has the potential to weaken the immune system. The body won’t get a chance to rest and repair itself if it’s too busy worrying about the future. It’s easy to see how all of these symptoms can be so easily overlooked, as each symptom can be just a part of childhood. However, severity of symptoms in conjunction with open communication with your child and listening to your intuition is the key in the journey of reducing anxiety. 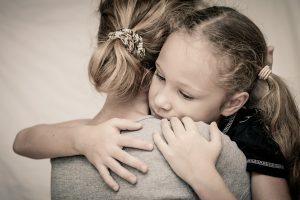 How do you help a child with anxiety? There is a variety of methods to help reduce anxiety in children however, keep in mind the child has the potential to get overwhelmed very easily. They may lack confidence to try new things to help them understand their emotions and that what they fear may not necessarily happen. Developing coping and problem-solving skills through open communication about their fears and worries in a safe and trusting environment is a great first step to take. Once your child’s confidence begins to increase, introducing help from a counsellor and psychologist will further aid their recovery. Anxiety does not have to carry the power to undermine such a precious and invaluable time in anyone’s life, especially a child’s. Anxiety can be scary; however it does not have to be permanent. Getting your child the right help to influence their mindset in a positive manner will enrich their lives in the present as well as the future. If you would like further information on anxiety in children, or you would like to find out about children’s counselling, play therapy or to find a psychologist, contact us today. “Anxiety”, (Beyond Blue), Available: https://healthyfamilies.beyondblue.org.au/age-6-12/mental-health-conditions-in-children/anxiety (Accessed: 2017, February 7). “Anxiety and Fears in Children”, raisingchildren.net.au Available: http://raisingchildren.net.au/articles/anxiety_and_fears.html (Accessed: 2017, February 7).